Educational physics animation : To see the invisible needs extraordinary vision, the discovery of nucleus was a landmark event that changed the course of science and development in this world leading to creation of nuclear power plants and ironically nuclear bombs. Lets see how this discovery was made by these extraordinary men. 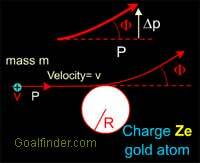 Why did he take Gold for studying the scattering of alpha rays? What were the observations of the experiment? 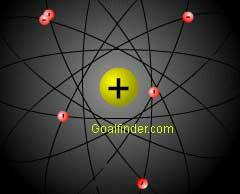 What holds the electron in circular orbit? Was Rutherford's atomic model able to explain the characteristics of matter and mystery of spectral lines? Why was Rutherford's model unstable? 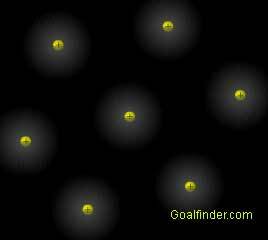 The science animation explains the following in a story like manner using in-depth explanation, the discovery of nucleus. Lord Rutherford while studying the nature of the Curie's radiation discovered that the radioactive elements emit three types of radiations with different penetrating power namely alpha (least penetrated), beta (moderately penetrating) and Gamma (highly penetrating). When these radiations were subjected to electric fields, alpha rays were found to be positively charged particles while beta rays were found as negatively charged light particles. Gamma rays were found to be neutral in nature. 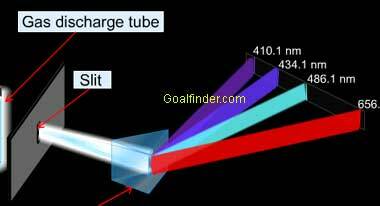 While studying the properties of these radiations, Rutherford noticed that the beam of alpha rays when were made to fall on a photographic plate by passing it through air, the edges of the slit became diffused and widened. He concluded that the alpha rays were scattered by air molecules. To get a clearer evidence about the scattering he along with his co-workers Geiger and Marsden built an apparatus to bombard alpha particles on thin metallic foils. The metallic foil he selected for his experiment was a very thin gold foil. Now if the atoms were actually arranged according to Thomson, then the alpha particles would go undeflected. But during experimentation it was found that though most of the alpha particles went right through the thin foil, a few alpha particles rebounded almost directly backwards. These large angle deflections were not consistent with Thomson's model. From the above observations he concluded that large scattering angles could only occur if most of the mass of the atom, and all of its positive charge reside in a very small, extremely dense region called the atomic nucleus. Thus Rutherford established a new model of the atom that was similar to the structure of planets in orbit around the sun. 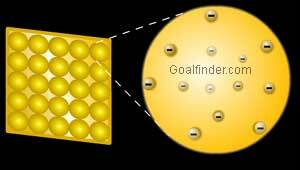 Rutherford's model consisted of a dense positive core at the center of the atom with electrons orbiting around it. This is called as Planetary Model of the atom. Though Rutherford was successful enough to explain the rearrangement of the charged particles within the atom, his model faced some serious problems. Ans: Actually thicker foils were initially used but a lot of scattering was observed so it was thought that the scattering is due to rebound from these thick foils hence a very thin 2000 atom thick gold foil was used to allow all alpha particles to pass through but even these were scattered. Ans: Electromagnetic waves are formed by vibration of an electric charge, these are transverse waves composed of a sinusoidal electric field oscillation and a sinusoidal magnetic field oscillation. The magnetic and electric field oscillations are in phase. 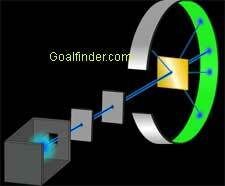 The magnetic field oscillates perpendicular (90°) to the electric field. They both oscillate perpendicular to the direction the wave travels. EM waves do not require a medium to propagate and they carry their own momentum. All EM waves travel at the speed of light in a vacuum. Electromagnetic radiation is classified into types according to the frequency of the wave, these types include (in order of increasing frequency): radio waves, microwaves, infrared radiation, visible light, ultraviolet radiation, X-rays and gamma rays. Ans: Gold nucleus consists of 79 protons and 79 Neutrons = 158 nucleons. Now Mass of Nucleon = 1.67×10^−27 kg, multiplying this by 158, we get, 158 x 1.67×10^−27 kg = 263.86×10^−27 kg, this is the Gold’s nuclear mass. Now Gold’s Nuclear Radius = 7.3 x10^-15. So its nuclear volume (Considering nucleus a sphere) is = 4/3 x pi x R^3. Substituting the value of Radius R in the equation, Volume = 4/3x 22/7 x (7.3 x10^-15)^3 = 1630.166 x 10^-45. Now dividing the mass by volume, 263.86x10^-27 / 1630.166 x 10^-45 = 0.16 x 10^18 = 1.6 x 10^17 kg /m3. This is the density of gold nucleus. Ans: Actually they will have the same reactions and effects as on a gold foil, gold foil was used because it was highly malleable and extremely thin (2,000 atoms thick -1/3000 inch thick) and uniform foil could be prepared for testing. Ans: The primary difference is that Rutherford’s was a planetary model while Bohr’s was a quantum model. Rutherford’s model had continuous states while Bohr’s model had discrete states. Rutherford’s Model was based on positions while Bohr’s was based on energy states. Ans: Rutherford’s model was different from Thomson’s. In Thomson’s all alpha particles should have directly passed through the atom as the positive charge was spread throughout, but in experimentation, it was found that though most of the alpha particles went right through the thin foil, a few alpha particles rebounded almost directly backwards. These large angle deflections were not consistent with Thomson's model. From the above observations Rutherford concluded that large scattering angles could only occur if most of the mass of the atom, and all of its positive charge reside in a very small, extremely dense region called the atomic nucleus. The repulsion between the highly charged gold nucleus and the particle is strong enough to deflect the less massive particle. Ans: Actually not only gold but lead, tin, aluminum, platinum, copper, Iron were used in experiment by Geiger and Marsden.. They preferred gold because it was highly malleable and extremely thin (2,000 atoms thick -1/3000 inch thick) and uniform foil could be prepared for testing. Ans: EM is responsible for all phenomenons except gravity but does not solve the sub-nuclear problem of protons remaining together in a small nucleus; for this the short-range strong Force and quarks model is used, where the protons are stabilized by exchanging mesons between themselves and with neutrons. This creates a strong force that can hold the nucleus together. This also postulates that protons and neutrons are made up of quarks and gluons- so are together called as nucleons. Ans: Note that Geiger-Marsden had in mind Thomson’s plum pudding model, positive charge pudding with electron studded like cherries. They expected the high-speed alpha particles to pass straight through the foil. Once the scattering of alpha particles occurred, they thought it was due to thickness of foil hence kept reducing it, as gold is highly malleable, a thin gold foil (2,000 atoms thick -1/3000 inch thick) could be made, but to their surprise the alpha particle were scattered from that also. Ans: I guess you are preparing a project , place a ball at the center and put either cotton around it to indicate electron cloud, or better still make an air tight glass box stick a small ball at its center and through a hole insert smoke seal the hole to indicate a cloud. Ans: An orbiting electron accelerates due to the centripetal force acting on it. Any accelerated charge particle loses its energy by emitting electromagnetic radiation. As the electron spirals in, it orbits faster and faster, generating electromagnetic waves of higher and higher frequency, until finally, it crashes into the nucleus itself. This means that the atom should emit a continuous band of spectrum but atoms were always found to emit the line spectra. Ans: Rutherford's atomic model failed to explain the unique spectral properties of the elements and their chemical properties and how were the atoms stable even though the electrons were emitting radiations. Later on Bohr modified the model as per quantum theory. Ans: Rutherford's discovery in today’s context has been relegated to one of the initial steps of introducing atom in schools. However, His continuous experiments & logic for putting a structure to atom a century ago, with antiquated tools and discovery of the nucleus was path breaking and laid down the foundation for research of today. Even though science has moved far ahead but the concept of nucleus still holds true. His discovery remains one of the very important turning points for science. Ans: The problem lay in the fact that an accelerating charge like electron will lose energy in form of electromagnetic radiation and will finally collapse into the nucleus annihilating the atom in nano seconds. This meant the atom will be unstable and matter will not exist but as we know matter has existed for eons so this led to the failure of Rutherford’s model. Ans: Rutherford's atomic model failed to explain the unique spectral properties of the elements and their chemical properties and how were the atoms stable even though the electrons were emitting radiations. Ans: It was Bohr, who explained the discrete spectra using quantum mechanics. Bohr could successfully calculate the energy and radius of the electron’s orbital using Balmer formula to prove that speed, radius and energy of the electron were quantized or a discrete quantity. However, he could not successfully explain why electron did not radiate while being in these orbital. Bohr’s orbital model was later abandoned and only its remarkably accurate energy level values were accepted. Ans: Bohr's model can be called as planetary model but with a difference that it proposes discreet orbits (energy levels) based on principal quantum number. Ans: From Curie’s radiation, he discovered alpha, beta and gamma radiations. Slit of photographic plates became diffused and widened when alpha rays fell on them. He concluded that alpha rays were being scattered by air molecules. He bombarded alpha particles on different metal foils. Some of them rebounded back. This was not consistent with Thomson’s model, as Alpha particles needed massive concentrated charge to rebound them. Rutherford visualized it to be the nucleus at the core of atoms. Ans: Hi Vidya, free download of animations except for some of those in the download section is not feasible, however our animation are viewable online through the key above snapshots section on random basis. That can be of use if your class has Internet connection. Ans: It is a misconception that alpha particles “hit “ the nucleus, the scattering is due to strong repulsion of small helium nucleus (alpha particles) by the massive gold nucleus. Ans: No, they are not related; Thomson’s model proposed embedding of electrons in a positive mass, while Rutherford’s model proposed a hollow atom with electrons revolving around the nucleus. Ans: We have a shopping card facility through which you can purchase and download the animation, it will run unlimited times on the computer. Please register to purchase it, once you have purchased it by paying online, it will be put in "My Account" section, download it from there to your computer. Ans: Please refer our animation and article section for his experiments and results, his famous quote was "It was as if you fired a 15-inch shell at a sheet of tissue paper and it came back to hit you." Ans: Nobel foundation in 1935 awarded Mr. James Chadwick, the prize in physics for the discovery of neutron, he used an used an ingenious method to probe into unseen, earlier Rutherford,Walther Bothe and Herbert Becker,Irène and Frédéric Joliot-Curie had discovered what they thought was a radiation, but Chadwick confirmed by his calculation and experiment that it was a particle "Neutron"